Flexera Software, the maker of InstallShield, is fully dedicated to powering the business of software for our customers. For over 25 years, Flexera's solutions have helped software and hardware producers and their customers maximize revenue, cut costs, and eliminate manual processes. Flexera Software provides solutions that power the business of software. By simplifying the business relationship between software/hardware producers and their customers, Flexera solutions have a 25-year history of maximizing the value of the software that the world develops and uses. Software is Getting More Complex. all the new Microsoft technologies. Used by over 70,000 software producers on more than 500 million desktops. InstallShield 2012 is the only installation solution capable of supporting the needs of today's sophisticated software producers for packaging both standalone offerings and complex suites. 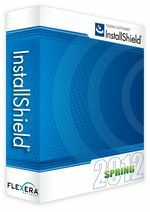 InstallShield 2012 has been updated to deliver a fresh, positive and friendly experience to meet the exacting standards of a new generation of app-savvy users. And, it's the only solution providing automated tools that empower software producers to productize, package and install their products in both traditional MSI and virtual formats. Understanding the needs of today's decentralized agile teams, means that Flexera Software can design a world-class installation solution that supports the installation authoring, building and bundling requirements of these teams. Suite Installations: Today's software producers are highly sophisticated when developing, packaging and distributing their software products. It's critical that they are able to offer products to the market as standalone offerings or bundled suites, while creating a unified installation experience. Until now, there hasn't been a solution that supports the complex product packaging requirements for a unified suite installation experience. With the new InstallShield Suite Project type, multiple products can be easily bundled together into a single, unified suite installation eliminating the need to develop a complex custom launcher or bootstrapper application. Installation Streaming: Meeting the needs of a new generation of "app-store savvy" users means that installations must be painless, fast and virtually transparent. With the new Installation Streaming feature, end users need only download a small file to quickly start the installation, giving a more immediate interaction with the product installation. As only the required packages are ever downloaded, the overall installation time can be greatly reduced. Installation Collaboration: Installation development used to be an isolated, tactical step at the tail end of an application development process managed by a dedicated team member. Today, it must be integrated into the agile development practices, where installation responsibilities are distributed amongst the team and are an essential element of the iterative, development process. The InstallShield 2012 Collaboration add-on has been significantly enhanced to better support distributed, collaborative installation development allowing product developers and technical writers to create and manage their portion of the installation. 64-Bit Enhancements: Windows 7 adoption continues and is also driving the adoption of the 64-bit operating system. Gartner predicts that by 2014, 75% of corporate PCs will be running 64-bit version of Windows. Comprehensive support for 64-bit installation development is now mandatory and InstallShield 2012 has been enhanced with new capabilities to provide the most comprehensive support for 64-bit installation development. Application Tagging: Enterprise customers have grown more sophisticated about software compliance management. If customers cannot easily track software usage they risk non-compliance. Software "self-instrumentation" or tagging is evolving as an industry standard, enabling software producers to create smarter applications that give customers better information for software asset management and license optimization initiatives. InstallShield 2012 is the only strategic installation development solution that creates ISO 19770-2 software identification tags as part of the installation development process. This enables software producers to help their customers by delivering better visibility into installed software estate in order to facilitate software compliance efforts. The technology landscape continues to change at an unprecedented rate, software developers using Visual Studio are having to become more agile in their development of applications within different environments. How can you aid developers to stay competitive and get their solutions to market faster? InstallShield 2012 Spring delivers a big step forward to developers creating applications for Windows 8, Visual Studio 11, Microsoft’s SQL Azure and System Center 2012 Configuration Manager. 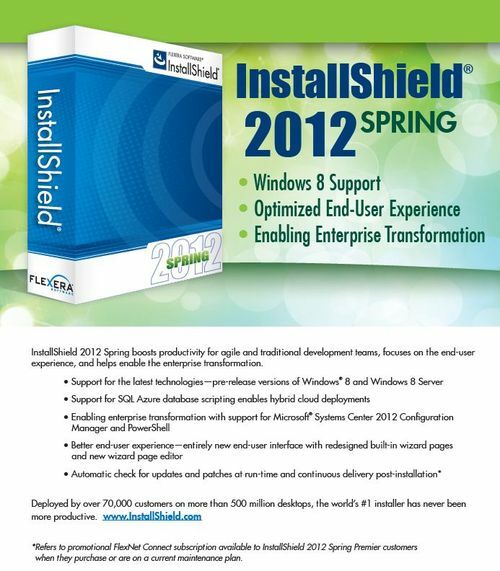 InstallShield 2012 Spring provides developers with support for emerging technologies and automated tools that allow developers to bundle and install their products in both traditional MSI and virtual application formats. *Applies to customers with maintenance plans. Large organisations are selecting their software by judging whose applications are easy to install, deploy and manage. InstallShield 2012 Spring provides developers with a strategic installation solution that makes them competitive in the tender process by demonstrating easy deployment and management application tools to meet the organisation's requirements. More developers trust InstallShield to give their software a flawless, localized installation experience, keeping their users happy and support cost down. Download trial version of InstallShield 2012 now. The world has changed. Development teams are more distributed. Products are more complex. Users are more sophisticated. InstallShield 2012 continues to meet the exacting standards of today’s agile software vendors, and exceed the expectations of today’s sophisticated users. Supports packaging for both standalone offerings and complex suites. Delivers a fresh, positive and friendly “app-store-like” experience. Provides automated tools for software producers to productize, package and install their products in both MSI and virtual formats. Supports installation authoring, building and bundling requirements of decentralized agile development teams. Until now, there hasn’t been a solution that supports the complex product packaging requirements for a unified suite installation experience. With the new InstallShield Suite Project type, multiple products can be easily bundled together into a single, unified suite installation. A next generation setup launcher (Setup.exe) that can conditionally run multiple installations (.msi or .exe) and apply Windows Installer patches (.msp) as needed on target systems. An entirely new end-user interface with redesigned built-in wizard pages and a new wizard page editor. An integrated progress bar that presents a unified, visual indication of the overall status of the entire suite installation process. Settings to specify whether to have a single entry in Add or Remove Programs. A single installation that includes both 32-bit packages and 64-bit packages and runs only the appropriate packages on each target system. Meeting the needs of a new generation of “app-store savvy” users means that installations must be painless, fast and virtually transparent. The new Installation Streaming feature reduces the downloading wait time required before installation can begin. End users need only download a small file to quickly start the installation. Based on the selected install options, only the required packages are downloaded from the web or extracted from the installation. On the Web, available for download by Setup.exe. Embedded in Setup.exe and extracted to the target system. Uncompressed and stored on the suite source media. Today, installation development must be integrated into agile development practices where installation responsibilities are distributed amongst the team and are an essential element of the iterative development process.The InstallShield 2012 Collaboration add-on has been significantly enhanced to better support distributed, collaborative installation development. A new project type called Developer Installation Manifest (DIM) which is a feature-sized collection of related items such as product files, shortcuts, registry entries, text file changes, IIS Web sites, and other elements that together make up a discrete portion of a product installation. A new Developer Installation Manifest Editor that can be separately installed and used by the entire product development team to create and manage their installation files. The manifest can then be dynamically or statically linked by the Installation Author to the product’s Basic MSI project. The InstallShield Premier Edition includes 5 licenses of the Developer Installation Manifest Editor, enabling product development teams to immediately start working collaboratively. Windows 7 adoption continues and is also driving the adoption of the 64-bit operating system. InstallShield 2012 provides the most comprehensive support for 64-bit installation development. Updated dependency scanners to identify 64-bit dependencies of the 64-bit files in a project. Support for setting permissions for files, folders and registry keys in 64-bit locations. A prerequisite that installs the 64-bit version of the Microsoft VSTO 2010 Runtime. Software “self-instrumentation” or tagging is evolving as an industry standard, enabling software producers to create smarter applications that give customers better information for software asset management and license optimization initiatives. InstallShield 2012 is the only strategic installation development solution that creates ISO 19770-2 software identification tags as part of the installation development process. Automatically creates the ISO 19770-2 tag during the installation development process and ensures it is deployed as part of the application’s install. Enhanced General Information view to manage the required metadata elements. Installs the tag in the locations as defined by the standard. Digitally sign tags (available in Q4 2011) in addition to your application files and setup. New monitoring method for COM extraction. Merge Module Projects now include built-in support for IIS, Text File Changes, and XML File Changes. Automation interface support for specifying the required execution level for Setup.exe. New prerequisites that install Internet Explorer 9, SQL Server 2008 R2 Native client, Windows Identify Foundation, and more. The ability to determine if Adobe Reader 10, Internet Explorer 9, or Microsoft Office (2010, 2007, or 2003) is installed on a target system. Available in three editions: Premier, Professional, and Express in both English and Japanese. Buy InstallShield as either a node-locked license or a concurrent license that developers can share. Buy extra Standalone Build licenses to better integrate installation and product build processes. Unlike homegrown solutions, InstallShield Express Edition shields you from the complexities of building a setup. It comes with an easy-to-use Project Assistant – a wizard that guides you through the MSI installation creating process, step-by-step. Avoid risk exposure and non-compliance—InstallShield 2012 is the only strategic installation development solution that creates ISO 19770-2 software identification tags as part of the installation development process. Advanced support for new technologies—Includes new prerequisites that install Internet Explorer 9, SQL Server 2008 R2 Native Client, Windows Identity Foundation, and more. Build installations for 64-bit installations—Create reliable installations for both 32-bit and 64-bit applications in one installation project. Better control your installations with InstallScript—Add InstallScript custom actions to your MSI projects or create InstallScript projects that control your entire installation. Validate your installations for Windows 7—Ensure your software installs and runs reliably on Windows 7. The top-tier InstallShield Premier Edition is the world’s most powerful and flexible solution for Windows installations. Software companies serious about providing reliable, professional installations for their applications trust the InstallShield Premier Edition. Support complex requirements with minimal scripting or coding—With the new InstallShield Suite Project type, multiple products can be easily bundled together into a single, unified suite installation, eliminating the need to develop a custom launcher or bootstrapper application. Provide an "app-store like" experience—End users only need to download a small file to quickly start the installation. Support distributed, collaborative installation development—The InstallShield 2012 Collaboration add-on allows distributed product developers and technical writers to more efficiently create and manage their portion of the installation. Premier Edition includes 5 licenses of Developer Installation Manifest Editor. More control over the user interface layout—An entirely new user interface with redesigned, built-in wizard pages and a new wizard page editor. Easily convert legacy installations into MSI packages—With InstallShield Repackager, you can easily create MSI packages. Create trial versions without modifying code—With the try-and-die type of trialware's simple configuration changes, you can easily offer potential customers a fully functional. trial version of your product (After the predetermined trial limit has been reached on an end user's machine, the trial version automatically expires).